Get yourself a fine tailored fitting suit made by Statement and it won't be your last. That is because when it comes to mens suits, Statement insists that the quality be above and beyond what you may find on other suits and you'll think that this suit cost well over a thousand dollars. 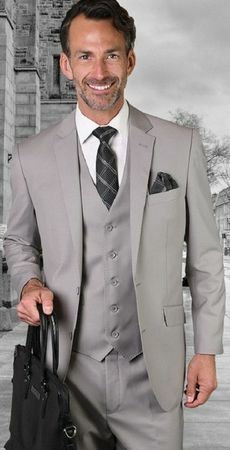 This fine looking platinum 3 piece suit features an Italian tailored fit and cut and comes with a two button style jacket with double vents, the vest and no pleat pants. All made of fine wool.